Slate was the predominant roofing material in the Victorian and Edwardian eras. Most slate came from Wales, and some from Cumbria. In the London area, slates are usually from North Wales (Bangor or Portmadoc) and often from the Penryhn quarry at Bethesda; they became a common roofing material once the railway and canal systems were in place. Welsh slate is thin and is riven to give a fairly smooth surface. Because it can be cut accurately, tiles have a consistent shape and size. They are smooth, and blue, purple or greenish-grey in colour. They are usually 20 by 10 inches (50.8 by 25.4 cm). The different sizes have names such as 'duchesses' and 'countesses'. The table below gives the standard sizes available. The colours available range from dark grey to silver grey, and there are purplish or plum and blue-grey hues. Welsh slate is laid in regular spaced, 'broken-bond' courses with a double lap. Less common are Cumbrian (Westmoreland) slates; these are rougher, green or dark blue, and in irregular sizes. These are laid with the largest sizes near the eaves and smallest slates at the ridge. Slate is a metamorphic rock which is impermeable, hard, close in texture, quick drying, frost resistant, fine grained and splits easily into thin leaves ('fissile'). 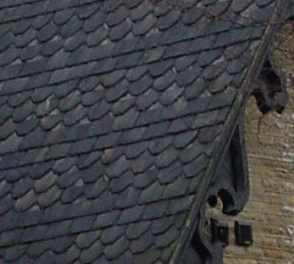 Slates in Britain have traditionally been made to standard sizes, most of which have been given names. The coverage is given for each size for a metre square, with a 75mm lap. So, for example, you need 18.24 Countess slates to cover a square metre - where the overlap is 75mm.